Combining assorted flavours from all around the Mediterranean with solid rock+reggae foundations, this New York-based band are the new electro/world sensation. Although the media have associated them with the so-called Gypsy Rock movement (as attested by the recent piece in Spin magazine, which featured BBB alongside Beirut and Gogol Bordello), their roots are reaching way beyond that: this very strong new album blends Greek guitars, Arab & Bulgarian guest singers, Balkanoid horns and elements of ragga and hip hop. Balkan Beat Box are an awesome live band, they've been making crowds go wild on various major festivals they appeared at, and will be touring around Europe throughout the year. They're nominated for a BBC Planet Award (in the Club Global category). 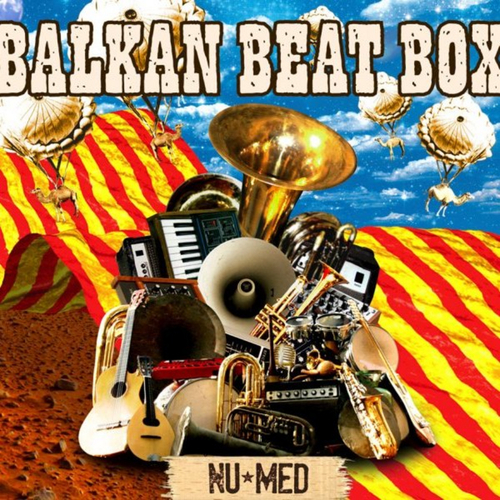 Unfortunately at this time we can't offer all the Balkan Beat Box - Nu Med tracks as individual flacs, as some of these tracks exceed the shops maximum (9mins) download length.